An ideal location for couples who want a quiet retreat close to the coast. Useful links to other accommodation in and around the Cleethorpes area. 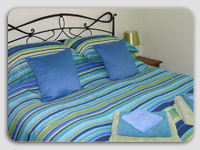 Skegness Guest House Accommodation - A full directory of guest accommodation in Skegness. Mablethorpe Guest Houses - Find holiday accommodation in Mablethorpe. Skegness holiday accommodation - Mill Farm Holiday Cottages in Chapel St Leonards, beautiful scenery combined with modern accommodation.